Enjoy a relaxing and rejuvenating soak in New Mexico natural, hot mineral springs while you are a guest at Casa Escondida B&B, which is located in historic Chimayo, NM (just 35 minutes north of Santa Fe or 50 minutes south of Taos). Our Taos area bed & breakfast is ideally located for visiting many of the best mineral hot springs in the country. If you are a hot springs enthusiast, then Casa Escondida Bed & Breakfast and northern New Mexico is for you! Touring the hot springs makes for a perfect daytrip or New Mexico romatic getaway. 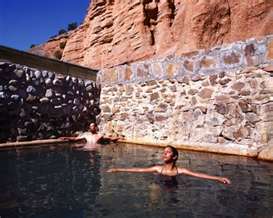 Facilities such as Ojo Caliente Mineral Springs Resort & Spa, offer hot springs that are within a resort or spa-type setting. These hot mineral pools are accessible via a paid entry fee. Additional services such as massages are available. The Jemez Springs Bath House offers soaking and massage services as well. However, the majority of the natural hot springs in New Mexico are located on public lands, such as the Santa Fe National Forest. These hot mineral springs require some hiking to get to. The natural beauty that surrounds the majority of our New Mexico hot springs is a double bonus! 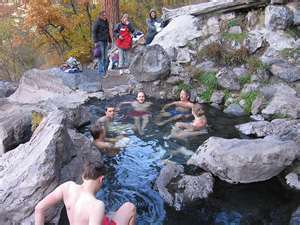 Some of the more popular hot springs within the forest area are Spence Hot Springs, McCauley Hot Springs, San Antonio Hot Springs and Soda Dam. The geothermal activity here in New Mexico (which is what allows hot springs to form) is some of the most significant in the United States! Did you know that hot springs form in areas where molten rock is close to the surface of the earth? This is what heats the waters. As the waters heat-up, they rise to the surface and voilà….hot springs! You already know how soothing a hot spring soak is but historically, many people also drank these waters for their supposed health benefits. Soaking in hot springs has been used for relaxation and for the treatment of disease for more than 5,000 years! Native Americans used these waters long before the Europeans ever arrived. You will find that the mineral composition of each hot spring varies and depends upon the type of rock that it flows through within the earth. Iron is considered to be beneficial to the blood and immune systems. Lithia is believed to relieve depression and aid digestion. Soda is said to relieve digestive problems. Arsenic is believed to provide relief from arthritis, stomach ulcers and to heal a variety of skin conditions. Prepare for your daytrip by bringing extra dry clothes, a towel, drinking water and a maybe even a delicious picnic lunch. Practice good hot spring etiquette by packing out everything that you bring in and stay on marked roads and trails. The staff at Casa Escondida Bed & Breakfast are happy to assist you in planning your hot spring adventure.